Published on October 29, 2008 in Other Beers. 2 Comments Tags: barleywine, cellar, rogue, share. While attending a wedding in Pugetopolis this past weekend, we crashed with Scott and Stephanie. The wedding was on a Friday night, so afterwards, everyone was pretty tired save Scott and I. So after everyone else was tucked in, we lounged downstairs, talked it up, and savored some of his homebrews. He had both a Dunkelweissen and Pumpkin ale on tap, and while both were great, I’m not a pumpkin ale fan so I stuck with the delicious Dunkel. 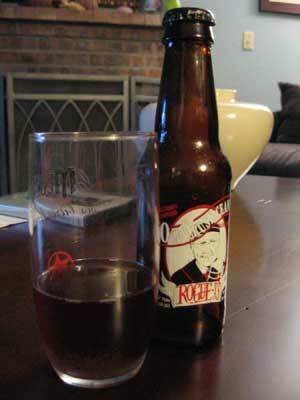 I also tried a bottled IPA which was excellent – just the right color, aroma and with plenty of citrusy hops. But then the mood changed when Scott broke a 1999 Old Crustacean out of his cellar. I thought he was teasing me at first since it was only a 7 oz bottle, and if you’re going to save a bottle for nearly a decade, how could you drink it just shy of that anniversary. He convinced me however because I was one of the few people he knows that relishes in barleywine. So he poured to small glasses and we sniffed. The smell was glorious. You never know what you’re going to get 9 years after you bottle something, but evidently the original recipe was right. The aroma was part brandy, part malt, and completely alluring. The first sip revealed the truth – this beer was OMFG good. After nearly a decade, the flavor was layers of aged ingredients. There was a gradient from port to grand marnier to chocolate to plums and raisins, then after a 15 second pause, a wash of bittersweet that I can only imagine were the hops begging for recognition. Amazingly, this sensation occurred every time you took a sip, even with the smallest draw of the nectar. I’m honored that Scott shared such a delicious beer with me. It made me consider cellaring beer for a second, but I’ve thought that before and it’s never really worked out. If you can find this sucker somewhere (ahem, bottleworks), I’d seriously recommend it.